So what do all these "gizzies" do? 1.) Index Gear provides rotational symmetry positions. 2.) Protractor provides the necessary facet angles. 4.) The lap provides the cutting power. 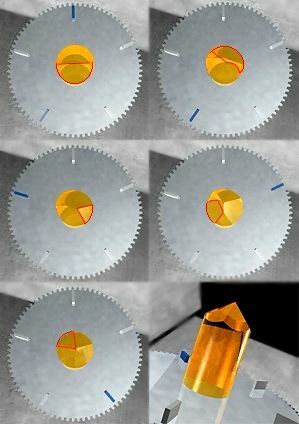 The Index Gear is locked on to a single setting position, and the lap will then cut a flat directly accross from the indicated position. Once a set of cuts is completed the stone will show the resultant symmetry. Index positions are shown in BLUE and the resultant cut is outlined in RED.